MANILA, Philippines — The� Department of Budget and Management� (DBM) expects� inflation� to settle within the government’s two to four percent target by the second quarter, a top official said yesterday. 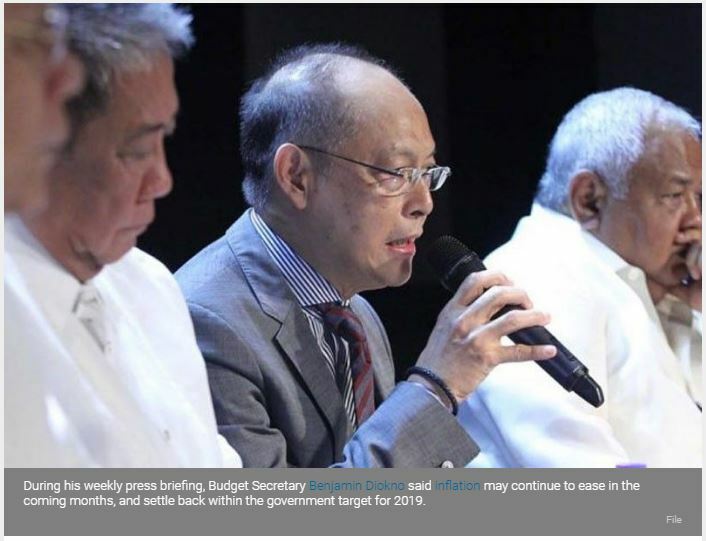 During his weekly press briefing, Budget Secretary� Benjamin Diokno� said� inflation� may continue to ease in the coming months, and settle back within the government target for 2019. “Around second quarter,” Diokno said when asked when he expects� inflation� to go back within target. According to Diokno,� inflation� has been tapering off since late last year after peaking at a near-decade high of 6.7 percent in September and October 2018. Further ahead, the budget chief sees� inflation� even going to as low as around two percent, or the lower end of the government target. “In fact, there are scenarios where we’ll see� inflation� around two percent in the third or fourth quarter,” he said. The last time monthly� inflation� fell within the government’s target was in February last year when it settled at 3.8 percent.� Inflation� then began to climb steadily before peaking at 6.7 percent in September and October. But after this, price pressures started to temper down, with� inflation� easing for three straight months until it hit 4.4 percent in January. Earlier, the Bangko Sentral ng Pilipinas (BSP) expects� inflation� to return within target as early as March. The central bank also lowered its latest� inflation� forecast for 2019 to 3.1 percent from the previous estimate of 3.2 percent, while the 2020 projection was maintained at three percent. To further reign in� inflation, economic managers earlier said they would continue to push for the implementation of non-monetary and administrative measures that would prevent supply bottlenecks, particularly in the agriculture sector.